Believe it or not, this is the only limited edition piece (along with the 88 Precious Dragon version with diamonds all over the clip) that Montblanc produced to commemorate the Year 2000. Furthermore, it commemorates the Chinese Year of the Golden Dragon, which only happens every 60 years. The next time the Golden Dragon Year occurs at the turn of the Millenium is the year 5000! This pen has a beautiful solid gold dragon clip showing incredible detail including two rubies inset in the eyes with the mouth caging a pearl. 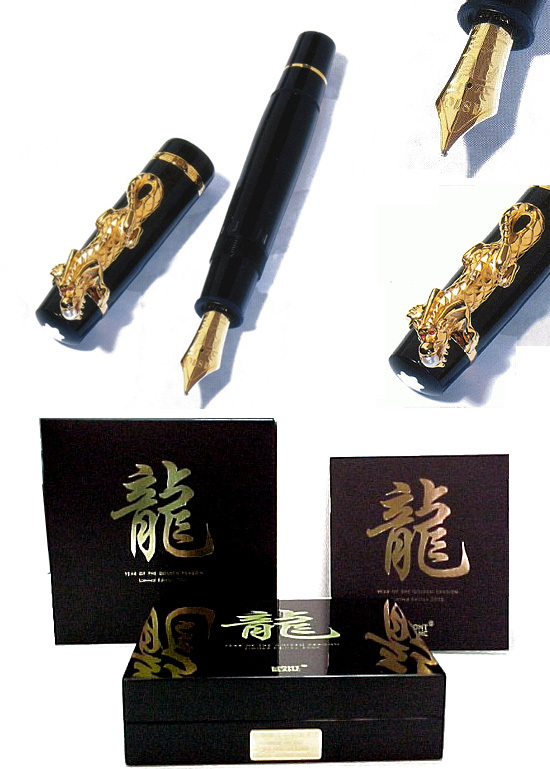 The enormous 18K gold nib is specially hand engraved with the Chinese Year of the Dragon. It comes in a magnificent black lacquer box. Only 2,000 pieces were made, making it one of the lowest production limited edition pens that Mont blanc has produced. None were released outside of Asia.